It's Lovely! I'll Take It! : Everybody say "I like it!" The house, the house, the house is on fire! It is a good thing you don't need water because the pool is underground and might be hard to find!!! WOW!!!! Just...... WOW!!! I mean..... WOW!! I'm trying to figure out if the truck is painted to appear rusted or if it is, in fact, rusted. Puh-lease. That is, like, so 1998. 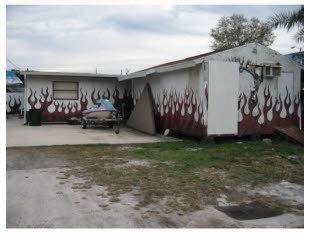 There was a rib house style restaurant here that had similar flames painted on the exterior. It went out of business a couple of months ago. I wondered if they could take a picture of it and send it to the insurance company saying it burnt down. Can I call it Rancho Vato? Please? That lineup of sofas in the living room gives me the creeps. There is something even more interesting when you go to the listing. I myself have never seen a family room with, I think I counted right, 5 couches. Five! How many stinkin' people are stayin' there??? Does one of the flames on the corner of the house appear to have a face? It doesn't right? That's just my imagination, isn't it? It must be because that would be even crazier than painting flames all around your house. Only marginally crazier, but still. Did they Photoshop out the Camaro? That's soooo something my boyfriend would do. Just think how easy it would be to give directions to this house. No need to force your visitors to squint to try and make out those silly house numbers. I'm surprised nobody commented on the neon sign on the roof-- must be for the cycle shop. If I did the math, that property's monthly income is currently $5500, far more than the carrying costs. What's the hitch? I think I may buy it! Like so many of these postings, I look at it and "ummm, wow" is about all I can come up with. so yeah, ummm, wow. i'm hoping they mean "inground" not "underground" coz otherwise it'd be even more creepy. a painted turd is still, well, a turd. Most intersting trailer I have EVER seen. Well, I'm glad to know the house is "very unique" because who wants one that's just mildly unique? Are all their friends homeless? They're set up to accommodate SIX 'couch-surfers' at a time. Now pass me a doobie. I'm surprised you could even see the "rusted" truck - it's camouflaged! Okay, I'm a scuba diver and love nothing more than a gigunda school of fish. But a giant bait ball glued to the kitchen wall? It would be cool if they actually swam and turned in unison, with the (Ikea) light glinting off of them. Since the photos don't show any signs of actual life, maybe the fish have gone all "nom-nom-nom?!?"